There are so many things to do in Fairbanks and the surrounding area. Whether viewing the famous Aurora Borealis is your focus, if you’re after some active outdoor time or wildlife viewing or even if arts and culture are more to your interest, you’re sure to find something to excite you in Fairbanks, Alaska. We’ve picked out some of the highlights and things we recommend and included them on our page, along with links to more information. 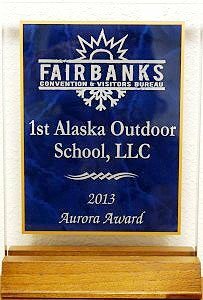 We hope you enjoy finding out what Fairbanks has to offer! The world famous aurora borealis or northern lights are top of most visitors list of things to do in Fairbanks. The spectacular dancing light displays can be seen from fall (September) and through the winter months. The aurora borealis is an amazing sight, with its colors shimmering and pulsating across the night sky. The best way to see the northern lights is to get out of the city on a clear night to where light pollution is at a minimum. Another of the most popular things to do in Fairbanks is to pay a visit to Chena Hot Springs. Only 60 miles from Fairbanks, this world renowned resort offers a day or evening of rest and relaxation in the historical location discovered by natives and early miners. Visitors take time to enjoy the healing water of the mineral hot springs in a beautiful natural setting. The resort is also home to the worlds largest year round ice museum with exhibits of spectacular ice carvings. World-class exhibits celebrating the people, land and culture of Interior Alaska, Native art, music, stories & dance. Dramatic architecture and fascinating exhibits tell the stories of Alaska’s diverse wildlife, people, and lands. Historical theme park with museums, shops, food & picnic areas. Board the Riverboat Discovery for a unique Alaskan experience. Museum with interactive exhibits designed for young people. Freshwater aquarium, exhibits, state-of-the-art sport fish hatchery. Authentic Alaskan Native art exhibits in an historic log house. Learn how this railroad played a role in Fairbanks’ first industry. A stunning display of historically significant Alaska automobiles. One of the iconic things to do in Fairbanks! Santa at his home in North Pole, have your photo taken with Mr. and Mrs. Claus. See this impressive feat of engineering, built to carry oil from the oilfields in Prudhoe Bay to Valdez, Alaska. Experience world class river fishing near Fairbanks, Alaska. Go on a nature walk with reindeer from Running Reindeer Ranch. Ski Area close to town with intermediate and advanced terrain. See first hand how the dredge worked the goldfields and try gold panning. Experience real Dog Mushing on trails used by Alaskan Mushers. Visit the Arctic Circle and enjoy beautiful scenery & wildlife along the way. Travel along the James Dalton Highway to Prudhoe Bay and the Arctic Ocean. Visit spectacular Denali National Park and participate in outdoor activities. Spot Moose, Beavers, Squirrels, Hares, Dall Sheep, Birds and more. There is an abundance of hiking trails around Fairbanks. Drift one of the Alaska Interiors spectacular rivers in a raft. Catch fish in a warm ice fishing cabin on a beautiful lake. Lavelles Bistro is a Fairbanks fine dining sensation, with globally influenced food and an extensive wine cellar. Rustic Fine Dining with an Alaskan atmosphere. Prime Rib, Seafood & Cocktails. Reservations recommended. A casual, family friendly bar & grill. The extensive menu features inventive Alaskan twists on bar food favorites. Warm and inviting brewery & restaurant, put this on your list of things to do in Fairbanks. Fine Dining overlooking the Chena River. Prime aged beef, Alaska seafood, premium wine list, and microbrews. Casual dining. Friar Tucks offers a delicious selection of hot & cold rolls, salads, sides, and appetizers. An all inclusive hotel offering 148 suites with full kitchens and a separate bedroom. Great location within walking distance to shopping district, near airport & university. Pike’s Waterfront Lodge offers comfortable rooms, many with scenic views, and cabins on the Chena River. The Lodge is next door to the famous Pike’s Landing restaurant. Friendly, welcoming service, complimentary breakfast and 4 different room types to choose from. Tucked away on 105 acres the Wedgewood Resort offers fully equipped 1 & 2 bedroom suites. Experience authentic Alaska at this stunning lodge. Choose a private room, family suite, or a secluded cottage.